To Get your personalised QR code Join Worky Today. 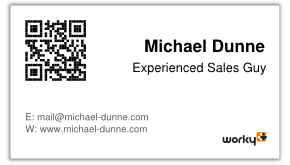 Get a set of ready to print Business Cards with a QR code to you Worky Profile. A QR Code is a 2 dimensional bar-code that is easily scanned using any modern mobile phone. This code will then be converted into a link to your Worky Profile. Users can scan the code to tweet or like your profile. QR technology can help you market yourself in a new and different way. You can promote yourself and your experience. Users can scan the code using freely available QR apps for smart phones. They can then immediately access your profile, LIKE or TWEET it. And of course they have instant access to your Worky profile, blog and video. You can generate and print your own QR codes for free on Worky. The QR code contains a link to your public profile on Worky in one small image that is scan-able by most smart phones. By adding a QR code to your business card, the other person will instantly be able to visit your profile. The advantages of having a QR Code on your business card is that you will make the print interactive. You will also have the ability to track any incoming clicks and at the same time you will stand out from the crowd as your business card will have a surprising new element. You can also improve your visibility in Google by improving your visibility on networking sites. Join Worky and create your stunning business cards with QR code. Copy and paste your personal QR code to your CV. Employers can then easily access your online profile, blog, video and status. And of course, having a personal QR code illustrates that you are in tune with the latest developments in technology and self-marketing.